Tlou Cholo, labour activist and struggle stalwart, today received recognition for a lifetime dedicated to the fight for justice and social accountability. The Tshwane University of Technology (TUT) awarded the highest academic accolade, an honorary doctorate (Doctor Technologiae Honoris Causa), to Cholo at its Spring Graduation ceremony at the Soshanguve Campus. “As a people’s university, TUT is proud to associate itself with people who espouse its core values, especially those associated with duty of care and social accountability. 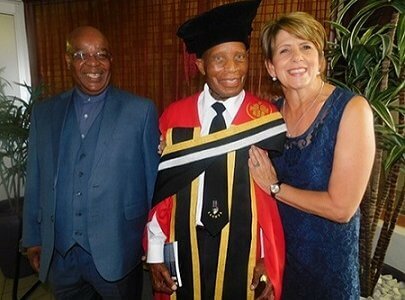 Today, the University recognises such a person, Mr Tlou Theophilus Cholo, an avid anti-Apartheid fighter, respected leader in the trade union movement in South Africa, one of the founders of the South African Congress of Trade Unions (SACTU) in the 1950’s, and recipient of the SA Government’s Order of Luthuli in Silver (2009). He not only believed in, but also actively fought for the cause of justice and an equal society. 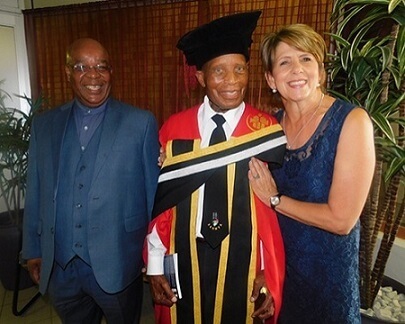 In recognition of his selfless devotion and sacrifice to the fight against apartheid towards a more equal society, TUT will bestow an Honorary Doctorate on Mr Cholo and would like to welcome him, as an honoured member, to the TUT family,” said Prof Stanley Mukhola, Deputy Vice-chancellor Teaching, Learning and Technology in his congratulatory remarks. “Back in the day, Cholo’s father was an active member of the Industrial and Commercial Union (ICU). Therefore, it comes as no surprise that the Polokwane born Cholo eventually chose to dedicate his life to fight for justice through unions. Like his father, Cholo’s courageous actions revealed the character of a man who believed in the cause of justice and an equal society,” Prof Mukhola added. His love for storytelling, his fierce nature and his strong desire for a free and democratic South Africa for all living here, soon became clear when he shared his life-story and experiences during the struggle with a captivated audience. Cholo could have chosen a safe life, but he continuously put his own life at risk for the love of his country and its people. “Hard work, ethics and focus are essential qualities to achieve your goals. I never shied away from doing the right and necessary things to achieve goals that would benefit the entire nation. I am proud to look back on a lifetime devoted to improving the living conditions and dignity of my fellow-countrymen,” he said. The 2018 Spring Graduation Ceremonies that started on 10 October will see which 3182 successful candidates receive their qualifications. Another highlight of this series of graduation ceremonies is the awarding of TUT’s first PhDs, in addition to the well-known De Tech degrees awarded by Universities of Technology. In the course of the graduations, 26 D Tech degrees and three PhDs will be conferred on successful candidates. The Faculty of Science will award two Doctor of Philosophy in Science at the Pretoria Campus on 24 October. The Faculty of Engineering and The Built Environment will also award its first Doctor of Engineering in Metallurgical Engineering on 26 October at the Pretoria Campus. Graduation ceremonies at the Soshanguve South commenced peacefully, as scheduled from 10 to 12 October. A security contingency plan is in place to ensure the safety of graduates and visitors during the graduations. A total of 1 545 graduates will receive qualifications during the first three graduation ceremonies on 10, 11 and 12 October at the Gencor Hall, starting at 10:00 daily. Today, 11 October, the University will celebrate Mr Tlou Theophilus Cholo’s extraordinary contributions to society with an Honorary Doctorate. Mr Cholo is an avid anti-apartheid fighter, respected leader in the trade union movement in South Africa, one of the founders of the South African Congress of Trade Unions (SACTU) in the 1950s, and recipient of the SA Government’s Order of Luthuli in Silver (2009) for his selfless devotion and sacrifice to the fight against apartheid. On 12 October, the Faculty of Humanities will award two Doctorate in Education degrees during the ceremony at 10:00. From 24 to 26 October, Spring Graduations for the remaining 1 637 graduates will be hosted at the Theunis Bester Hall, Pretoria Campus.